Filled with oohs, ahs, and plenty of love and warm wishes for the glowing, expecting mom, baby showers are lovely celebrations and perfect occasions for cupcakes -- particularly of the teensy variety. My assistant and I were thrilled when Joy requested a batch of mini cupcakes for her friend, Jaclyn's baby shower, sharing with us a copy of the invitation to the "Bollywood Baby"-themed shower for inspiration. And inspired we were! 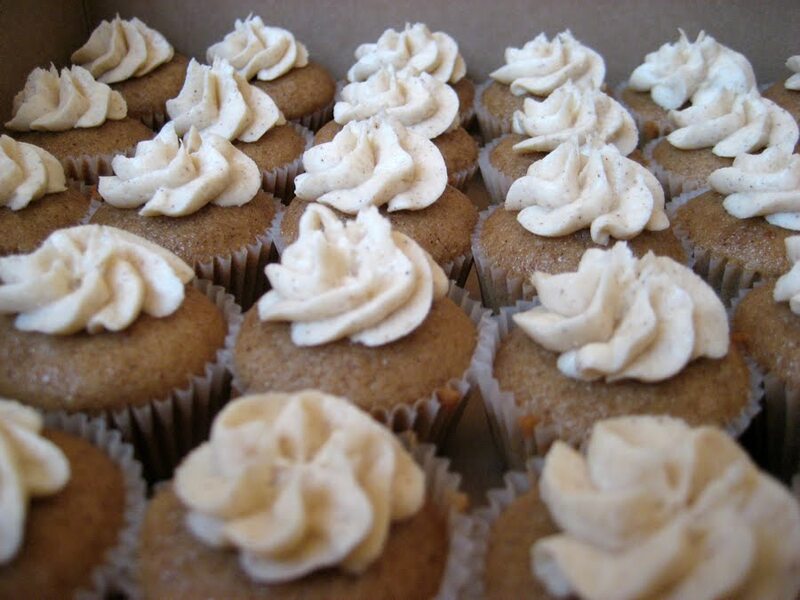 Made with strong Masala chai, milk, and plenty of aromatic spices, including cardamom, cinnamon, ground ginger, and clove, these petite cupcakes were rich with chai flavor. And topped with a floret of vanilla cream cheese frosting speckled with chai spices, these babycakes were something of a tease: "But we're too cute to be eaten!" I hope that didn't stop any of the guests from indulging in these one-bite wonders! Thanks so much, Joy, for trusting us with such an important order and for giving us free rein to design a cupcake matching the Bollywood Baby theme. I hope everyone enjoyed the babycakes as much as my assistant and I enjoyed making them. And congratulations, Jaclyn! I LOVED THESE EVEN THOUGH I ONLY HAD ONE!!! !